So the nest is empty once again. The birds have flown (literally) and I’m searching every little nook and cranny for a feather. When I find one, it just brings me down. Three-year old Zachary left his train whistle. His momma left a fleece jacket. My son and the daffodil (De Facto Daughter-In-Law, if you’re new here) left behind a list they will need with them. It all makes me miss them more. So I’m packing stuff to mail off, and drying my tears as I go. Just a day ago the house was full of life and extra beds and loads of wet towels. Sink full of dishes, and food everywhere, and noise and music and talk, talk, talk. The signs of life that I miss so much now. CoTU and I just can’t muster up that level of activity alone. I will give him credit for dirtying almost as many dishes as we did with all the houseguests, and the extended family that we had here to see them. He does what he can to add to the clutter, and I certainly appreciate it. (Sarcasm is just another service we offer here at the House of Casa de Rubin Place.) He is sympathetic, and is trying to cheer me up by reminding me how soon we’ll see them all again. Yeah, but why do they have to live so far away? With the kids here, my in-laws came over; my step-daughter came by, my brother and sister-in-law, sister-in-law and brother-in-law, four calling birds, three French hens, two turtle doves and the proverbial partridge in a pear tree. There was activity, conversation and a constant flow of food. And the resulting dishes. And we looked upon it, and yea—it was all good. Now I see emptiness and stack upon stack of folded sheets and towels. Signs of a family departed. On the bright side, however, I’m only washing dishes for two. This means that my semi-chapped hands may heal up. On the sad side, however, the floor puzzles are put away and the children’s books have been returned to the library. Z and I were doing an “I Spy” puzzle on the kitchen floor Sunday, when everyone else was out. It was for ages 5 and up, and the Z-man is 3. I figured we could do it together. Problem one: the puzzle, it turns out, is shaped like a gingerbread man. Aren’t there federal laws about puzzles being square or rectangular? There should be. Problem two: the pieces are repetitive and somewhat warped. But you know me, never short on opinions, so I will give you my rapid rundown on Boston in a nutshell. Three great things about Boston: great architecture, amazing historic sites, and fantastic seafood. Three awful things about Boston: terrible traffic, horrible drivers, crazy roads. And, Boston, I have to tell you something: What you call ‘North Square’ is actually a triangle. Really. Did you miss Sesame Street the day they explained that a triangle has three sides, and a square has four? I think maybe that’s what happened to you. I guess you’re not going to change all the signs now, but maybe you could put a footnote in to indicate that you know the difference. Oh yes, one more thing. 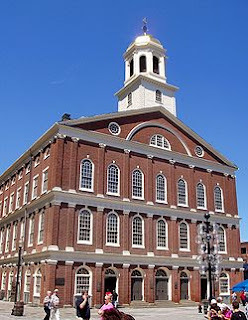 How could you take Faneuil Hall, the great historic meeting place built in 1740, and turn it into an open market of stalls with the worst kind of tourist kitschy krap ever seen? Did anyone think we needed more vendors of keychains, t-shirts and mugs? No, they did not. Bad idea; poor form. Could someone there just click a giant ‘undo’ key? I’m going to be a little scarce again till next Tuesday, as two of the other kids are coming in town for the weekend! There’s going to be a bridal shower for the Daffodil, (you remember: De Facto Daughter-in-Law), so she and my son are coming in, and my daughter and 3 year-old grandson are coming in, too. It’s going to be organized chaos around here, and all of it good. Except for the parts that are extremely good and great! I’m so excited I can’t stand it! See you Tuesday! Some people think that the world is divided into two types of people: number people and word people. Personally, I think that the world is divided into two types of people: those who divide the world into two types of people and those who don't. But that's not important right now. Anyhoo, back to our number people/word people situation. My problem is this. I may be both. Seriously, what was my license plate number when I had the Chrysler LeBaron? I've got that covered. Heck, I can tell you the license plate of the car my neighbor drove when we carpooled our kids to preschool a zillion years ago. Why? I have no idea. I mean, I know why I learned her plate number at the time. It occurred to me, like a crazy young mother, that in case of an accident, I should know what make and model of car my child was riding off in, and that knowing the license number was an extra added bit of potentially helpful knowledge. How could it hurt? The problem is, SFS020 hasn't been relevant for twenty-five years, so why won't it go away? A good ten years ago my step-daughter realized she could aske me the address or phone number of anyone in the family, and I could tell her, without looking it up. She dubbed me Rainman. It's a worry. I grew up with a phone number that ended in -1789, so I always thought of it as (shall we say) 555-French Revolution. My friend Beth's number ends in the iconic -1984, and she tells people to call "555-George Orwell". In 1992, when I changed jobs my best friend lamented, "I'll never learn your new phone number!" (She freely admitted to being my polar opposite on this little task.) I assured her that whatever it turned out to be, we'd come up with a gimmick to make it memorable. Fortunately it turned out to be easy. The prefix was just one number away from my home prefix. (So say, 555- became 655-.) And the final four numbers were -6794. I had only to tell her, it's the year we graduated high school, followed by the year our kids will graduate high school. That she could handle. When I'm reading a book, I am compelled to calculate my percentage of completion when I put it on the nightstand and turn out the light. I like knowing I've read 82% of the book, for example. I know. It doesn't sound healthy. My husband, the Center of the Universe (CoTU) thinks it is particularly worrisome that I have committed more than one credit card, complete with expiration dates and three-digit security codes, to memory. But it comes in handy when making hotel reservations by phone or online, not to mention shopping online. Is that so wrong? Not long ago, CoTU and I stopped at Chipotle for a quick lunch. We had a two-for-one coupon, and the youthful cashier piped up "$10.66!" at the register. In unison, CoTU and I answered with a Visa card and "The Battle of Hastings!" "Huh?" she wittily replied, being of a generation who has apparently not been required to memorize such trivial dates. "Nothing important," I said, letting her off the hook. Why should she feel responsible for the Norman conquest of England? After all, it was a long time ago, and what's Norman ever done for her? Maybe they don't even teach that stuff any more. I couldn't say. I get to keep my so-called skills sharp by the fact that it seems that one or another of our kids always seems to be moving. In the next three months two of our kids will move again. New addresses, zip codes, and phone numbers to memorize. Life is beautiful. Get yourself a cupcake-- it's my 100th post! There are lots of articles currently being written about mothers who blog. They are labeled “Mommy Bloggers”, in the condescending tone that surprises no one. Even in the 21st century. Specifically, much has been said about how they neglect their kids for their own selfish needs, promoting their interests and pumping up their egos. So once again, it’s the damned-if-you-do, damned-if-you-don’t conundrum. I should probably note that there are zillions more women who would love to have this option, but economic realities prevent them from being able to do so. This is not to say that I believe that there are none out there who simply see it as an excuse not to hold a paying job. I get that. But I also believe that’s an insignificant part of the equation, based on my extensive experience as someone who does no actual scientific research, and relies exclusively on my Master’s Degree from Seat of the Pants University. By the way, did you know that 82.6% of all statistics are made up on the spot? But that’s not important right now. “Mommy bloggers”, if you will, (and you probably will), are everywhere. And why not? There are times when the baby is sleeping/playing/learning without your constant input. So women can find moments in their days (or nights) to plink out their thoughts and ideas, and have a venue to share those thoughts and ideas with others. Some bloggers only post once a week; does it make sense to think that their children are being neglected and ignored in the interest of that level of output? Even those who post daily can’t be hung out to dry as derelict in their maternal duties for the production of 300-600 words. My thinking is that there are plenty of stay-at-home moms who DON’T blog, and still neglect their kids. And there are working-outside-the-home moms who are perfectly wonderful, loving, devoted women who put their kids first and possibly blog, too. Who knows? I just wonder when we as a society will stop the hypercritical approach to women overall. My current peeve is the number of mothers I see on the phone in public. Now, even the time moms spend with their kids doing errands-- in the car, in the mall, at the supermarket-- they're on the phone. I mall-walk for exercise, and in the course of forty minutes worth of laps around the concrete and marble, I see a lot of moms and pre-school kids. The kid is left to shlep along behind, or alongside, virtually unnoticed by the mom. She’s on the phone. Then you see them in restaurants, doing the same thing. They don't talk to their kids, or more important-- LISTEN to their kids; they're on the damn phone! Not for a quick, “Hi, honey, don’t forget we’re having your parents over for dinner tonight,” but conversations that take up the entire meal. What message are those moms (or DADS) sending to their kids? You know about the “Hang Up and Drive” campaign to get drivers to cede their cell phones? I’m ready to launch a “Hang Up and Parent” campaign to try to make a difference. What do you think? Would it be do-able? Everyone seems to be talking about losing weight these days. More than at any time other than the dreaded New Year’s resolutions, it seems to me as if we are all obsessing about our weight. We’re reading about it, we’re talking about it, and of course, we’re blogging about it. Most of us, of course, want to lose weight; I don’t personally know anyone who’s actually trying to gain weight, although I imagine there are some people out there who are in that boat. In this boat, the BIG boat, the boat where most of us are pretty sure that our asses make our pants look big, and not the other way around, we are cutting down our eating, and increasing our exercise. Well, for those who haven’t made it all the way to ‘exercise’, at least they are ramping up the activity level, or so they say. Some of us just have five, or maybe ten pounds to lose, some of us have a whole lot more. Whatever the goal, it’s important to remember that we are all capable of getting there. Of course, I may be 90 by the time I lose the next nine pounds, given how long it’s taken me to lose the first six, but I intend to get there. It seems that my metabolism has deserted me. Since I’m using this boat metaphor, I guess I should say it bailed on me. Gone. Nothing. Nada, niente, zipperooni. But I’m still determined to get there. It’s a process, right? --like so many things. So, with the foregoing in mind, say my ideal weight is 150. Then over the years, aging, imprudent food choices, aging, the lack of exercise and aging brought me to 160. Which I hated, because being 10 pounds over your ideal weight (especially if I really WERE 5’2”) makes your clothes not fit, makes you feel like a bit of a blimp (especially if I WERE 5’2”) and generally saps your energy and confidence. So, I hated seeing 160 on the scale every morning, and couldn’t wait to getting back to exercise and smarter eating and getting back to my best weight. Then. The holidays. Most years I don’t really put on weight over the holidays, but this year I did. I let the hubster cajole me into joining him in sharing some foods and drinks that were virtually guaranteed to slap some extra avoirdupois on the places I least needed it. I’m not blaming him, mind you—I’m a free-thinking, independent woman who just weakened and indulged when she should not have. Shame on me. So one day, instead of 160, I see 162. YIKES! I gotta get serious. Then 164. Oh no you dih-uhnt! And at last, 165. [Yeah, you know, not really 165, but 15 pounds above where I should ideally be.] So I’m totally shamed, wanna die, blah, blah, blah… Every new number is another knife blow to my heart. But here’s the funny thing: Once I started losing weight, the numbers held different meaning. On the way up, 163 was like SHAME and humiliation, and omigod how did I ever let myself gain this weight? But on the way down, I see 163, and say, wow—163! All right! Good for me—I’m looking better already! You know, it’s only three pounds, and now I’ve lost six altogether, which is practically an Olsen twin, so give me some love, people! I’m going to make it happen. And guess what? I’m taking the hubby with me! I haven’t talked about it much lately, but long-time readers will recall that my son got engaged last August. His fiancé, who I must still refer to as ‘the Daffodil’ is fabulous. Why ‘the Daffodil’, you ask? Because they are in their late 20s, have been together more than five years, and ‘girlfriend’ just didn’t seem adequate. It seemed trivial, in a way. I thought of her as my ‘de facto daughter-in-law’—see? DFDIL. Daffodil. Isn’t it obvious? Anyhoo… Soon she can shed that sobriquet and be my daughter-in-law officially. So the wedding date rapidly approaches, and the excitement is mounting. The Daffodil spent the weekend assembling the invitation materials, while the groom-to-be was away for the weekend for a bachelor party. His friends gathered to celebrate with him as the last spring break of graduate school came to a close. My job? I spent the afternoon making candies for the bridal shower my sister-in-law is hosting for them. She needs them a little ahead of time so she can assemble little packets for the guests to take home as party favors. I’ve got them all wrapped up tight to stay nice and fresh till then, but I snapped a few photos of them to share with you. The bride has chosen orange and cranberry-colored flowers for the occasion, and her bridesmaids will be wearing chocolate brown. You will see a correlation to the candies I made. I swirled some red and some yellow together to customize the colors. I hope she likes loves them. You may have seen the materials for making candy at your craft store. Trust me, this is easy-peasy stuff, and fun to do. People enjoy them, and it adds a special, personalized note to special occasions. I’ve done this for years for bridal showers, baby showers, birthday parties, anniversaries, graduations, and assorted weird gatherings. While a store like Michael's or Hobby Lobby will have some basic (but very useful and very cute) candy molds (we’re talking about $1.99 here), if your area has a cake decorating shop like our Karen Ann’s or Sallie’s, you can find some really specialized designs. Like the cactus and chili pepper molds I got for our annual Chili Party. Or the posh medallions with 60 on them, for a 60th anniversary party. Check it out. I made wedding bells, bride and groom couples, hearts with 'Love' on them, and wedding cakes! You nuke the candy melts (again, Michael’s, Joann’s, Hobby Lobby) and spoon them into the molds. Stick them in the fridge, and soon you can just pop them out and go again! As I said: Easy-peasy. As I was finishing up, the Center of the Universe stopped by the kitchen, tongue hanging out, jonesing for samples. Yep, he did. So now we know—willpower he has. It’s the won’t-power he’s missing. You may have noticed that we’ve had a few recent posts on why men don’t live as long as women do. The typical self-starter could take those posts and re-frame them as lessons on how to extend their life expectancies. It has been my experience, however, that most people benefit from the more direct approach, and would like to have these things spelled out for them. That said, here comes a step-by-step guide to a longer and happier life. 1. Listen to your partner. I’m not talking about fake listening. I’m saying you should learn to really ‘be in the moment’, and pay attention when she talks. This is not difficult, it costs you nothing, and the rewards are both tangible and intangible. None of that “Uh-huh, uh-huh, yeah,” stuff that you think makes HER think you’re listening. She sees through that, and you’re losing ground. Pretend she’s one of the guys, and the subject is football/fishing/cars/hoops/brewskis. Or that she’s your boss, and your performance review is today. 2. Make eye contact when either one of you is talking. This is worth its weight in tequila, and I’m not kidding. You’d be surprised how valuable it is. For one thing, it leads to greater intimacy, and that’s pretty much what you’re after anyway, right? Try it—it’s also free. 4. Everything you think does not need to be said aloud. To wit, if you have some pleasant memories of an ex-girlfriend (or ex-wife, for that matter), you would be well-advised to keep them to yourself. That includes sharing with the guys, because one of those bozos is likely to pop off about it in front of your partner. Seriously, you can’t be as naïve as Tiger Woods, and think that nobody’s going to blab. 5. It’s all well and good for your partner to point out that someone you see is attractive, beautiful, or even gorgeous. It is not all right for YOU to do so, unless you can credibly couch it in terms of said woman being LESS attractive than she is. The correct answer is never, NEVER “Yummy.” This led to an unfortunate meeting of someone’s skull and a cast-iron skillet. In my dreams. Hey—you dream your dreams, and I’ll dream mine. This concludes today’s lesson on survival skills for men. Tune in often for updates, and feel free to write for help as needed. I like to think I’m a sensitive and caring person. I’ve been told that I am on numerous occasions. A previous boss of mine told me I was the most considerate person she’d ever met. For example, there’s a reporter on NPR named Mandelit del Barco. Everyone goes out of his or her way to pronounce it “Mon-day-leet del bahrrrrrco”. I get that, and I support that. But here’s where I get a little sketchy. Why do we do that only for Hispanic names? I mean, when we were hearing Supreme Court Justice Sonia Sottomayor’s name twenty times a day, it was always done with the proper “So-toe-my-oar” pronunciation. But when we discuss Justice Alito or Justice Scalia, we say their names as if they were not derived from Italian (or any other foreign) heritage. We gloss over the vowels, and neglect the inflection that would give them the character of their origin. Our oversight extends to other foreign names, too. What about Conan O’Brien? Using the Hispanic standard, we should be calling him Conan O’Brrrrrrrrien. We never say Uma Thurman in that sing-songy voice that the Swedish Chef on The Muppet Show taught us to use for all things Swedish. We don’t call the inventor of blue jeans “Levi Shtrrrrauss”. We certainly don’t affect a British accent when we speak of Paul McCartney, Winston Churchill or the Queen. We come close when we speak of the French president, Nicolas Sarkozy. A few try to slide on the name, and overlook his nationality, but for the most part we hear him called “Sar-co-ZEE” imitating the inflection of the French, but still omitting the appropriate soft “gl” sound that they give the letter ‘r’. So the question remains, do we apply this courtesy only to the Hispanic because they are such a large part of the U.S. populace, or is there another reason? Maybe we just like the way their language sounds, and we begin to consider ourselves more inclusive if we deliberately affect their pronunciation. Either way, I’ll be on the lookout for more examples of how we honor, or fail to honor, folks with names from other languages. In the meantime, I’m going to fix myself a burrrrrrrrrrrrrrrrrito. Which rhymes with ‘neat-o’, not Speedo. Late this afternoon, CoTU was leaving for a dinner-meeting, but stopped in the kitchen for an Alka-Seltzer to settle his stomach, which could have been rebelling about that massive plate of spaghetti Bolognese he downed for lunch, not that I’m criticizing. Oh yes, we met from opposite directions where we had separate morning commitments, to share a little lunch at this relatively new Italian place some friends had recommended. This was not exactly in keeping with my current diet regimen, but I can’t keep refusing him every time he wants to eat out. He’s been very understanding, as I continually lobby for letting me fix us lunches and dinners at home, so I can stick to my diet. Today he called me when he left his meeting, and I was leaving mine. He sounded so plaintive, I figured I could lean into it and find the closest thing to legal they had to offer. The place was attractive. High ceilings, spare decoration, good lighting. Kind of Tuscan colors and fixtures. They had an interesting way of serving water, with the skinniest glasses I’ve ever seen, and a carafe on the table. We waited a long time for our lunches, and they were big, piping hot, and tasty. I ate about 30% of mine, CoTU finished his. And the bread. I said not a word. I am not here to criticize. I am here to judge. And so we came home in our separate cars, and went back to work in our separate rooms, and I got ready to leave town tomorrow for a weekend retreat. At least, that’s what I’m telling him. No, really, it’s a retreat. Or not. I did a lot of cooking, to take dinner to a friend’s house, and to leave some edibles in the fridge for CoTU. When he stopped in the kitchen for his Alka-Seltzer, remarking about his gastric discomfort, he complimented the aromas and the colorful array of the elements of my soon-to-be-mobile dinner delivery. Then he spotted the brownies. I had cut up the whole batch, and artfully arranged all but two of them on a doily-covered plate. He asked, like an expectant puppy dog, if those last two in the pan were for him. I confirmed that they were. And then, my friends, I witnessed a remarkable feat. An act of uncommon optimism and expectation. The man swallowed two brownies in no time at all, and washed ‘em down with an Alka-Seltzer chaser. And there you have it—another reason men do not live as long as women. Reasons men die younger than women. For one, remember the other day when the Center of the Universe (CoTU) nearly walked headlong into a pillar during our mall walk? He was leering at a slutty-looking young woman dressed in high-heeled boots, skin-tight jeans and a clingy sweater. She was strutting over to the “Coffee Cart” when we were coming around the bend of our second lap. Fast forward to yesterday… CoTU and I are rounding that same bend at the mall, pumping our arms, trying to rev up the old metabolism. The doctor’s chart may not consider either one of us to be officially overweight, but we both feel better and look better with about ten fewer pounds on us. We can smell the pastries as we approach the Coffee Cart, and CoTU begins veering over toward the counter, craning his neck like a giraffe. Great. I can only shake my head in amazement. Next time I’ll let him walk into the pillar. This morning he comes home from a meeting. “You’ll never guess who I ran into,” he challenges me. For once, I don’t even have a guess, and I’ve been known to pull some of these out of thin air, like a little spurt of e.s.p. He gave me a full run-down on her job and her family. “How does she look?” I asked. “Old and big,” he supplied, with his usual absence of tact. Before the words were completely out of his mouth he was laughing so hard he couldn’t inhale. Even I had to laugh. Then I hit him with a skillet. Shame on me for skipping a day here at Funny Is the New Young, but a dear friend lost her nearly five-year battle with ovarian cancer Sunday. I will miss her greatly. My heart hurts for her lovely, loving, supportive family. Their unity and devotion are exemplary. Even Erma would understand that sometimes we don’t have to be funny, and that we can just expose our underbellies and ask for a bit of understanding, wouldn’t she? And my sweet friend would want me to use the moment to remind—no, to urge you all to be alert to the symptoms of ovarian cancer, and to support research and awareness efforts of this deadly disease. As the amazing Anne Lamott would say, “Traveling mercies, Sandy.” I’m glad your pain is over. 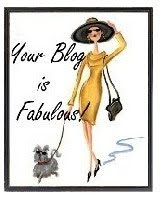 On a lighter note, and one of appreciation, the inspiring and insightful writer Nancy at F8hasit has seen fit to make this humble site the “Blog of Note” at her place! Many thanks to her for the honor, and for her confidence in my little offerings. Nancy’s one of the very best, and it means a great deal coming from someone I admire so much. 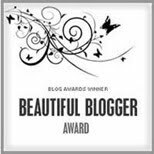 Meanwhile, in another part of the blogosphere, the adorable Suzanne Westover of 30: Own Up to Being Grown Up has bestowed the Beautiful Blogger award on me! Again, this lovely feedback just reinforces the urge to continue putting it out there, as they say. Thanks, Suzanne—I so appreciate it.